Markets may still be hitting new highs, but multiple warning signs reveal there’s trouble brewing beneath the surface. In fact, there’s significant proof from four key indicators that our current bull market is perfectly primed for a large scale sell-off. Stocks have become increasingly overvalued over the past several years. But today they’re flirting with levels of overvaluation we’ve seen only two other times in U.S. history. Cyclically adjusted price to earnings ratio (CAPE) is the metric used to measure this phenomenon. It weighs stock prices against profits and earnings, and uses historical data to give context to current valuations. Right now, the CAPE sits just above 31. In other words, investors are buying stock for more than 31 times profit and earnings. Before the dot com bubble popped in 2000. This is a problem because it means investors are paying a hefty premium for stocks based solely on the notion that prices will continue to rise as more people irrationally buy — not on the economic fundamentals of profit and earnings. Eventually, stock owners realize their shares are priced higher than their realistic worth, triggering a sell-off in response. 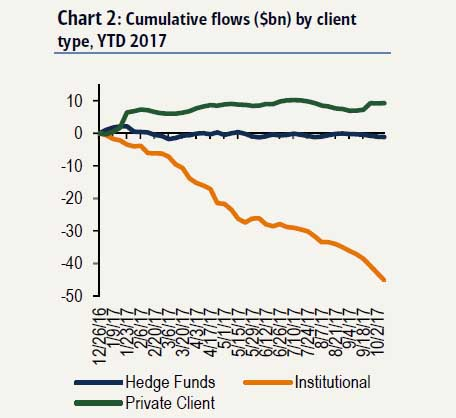 Despite climbing prices, institutional investors have been unloading stocks rapidly throughout 2017.
Insider selling broke a 10-year record earlier this year, and institutional clients of the nation’s largest investing firms like Bank of America Merrill Lynch and JPMorgan have been on a strong equities selling streak for months. As you can see, there has been massive institutional selling since the start of 2017. Do they know something that we don’t? While institutional investors unload stocks at unheard-of rates, individual retail investors are piling into the same securities faster than ever — primarily enthusiastic millennial investors tempted by the recent uptick in markets. In July, Schwab reported the largest number of new brokerage account openings in a single quarter since 2000. And a recent investment survey by E*Trade showed this new horde of greed-driven millennial investors plans to move away from cash and toward new stock positions in the remainder of 2017. According to a June survey from Legg Mason, nearly 80% of millennial investors plan to take on more risk this year, with 66% of them expressing an interest in equities. About 45% plan to take on “much more risk” in their portfolios. 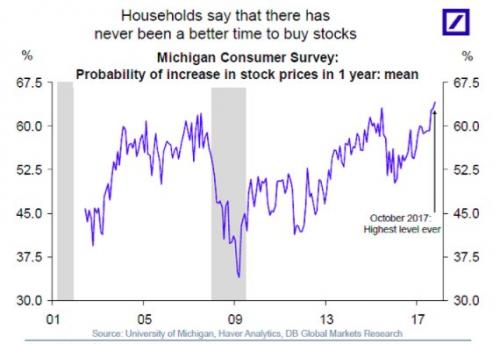 This was also confirmed by the recent UMichigan Consumer Survey, according to which surveyed households said there has – quite literally – never been a better time to buy stocks. Multiple leading analysts are sounding the alarm bells that this bull market is nearing an end. One leading strategist explains how the baseless enthusiasm in today’s markets is a sign that this rally could be on its last legs. 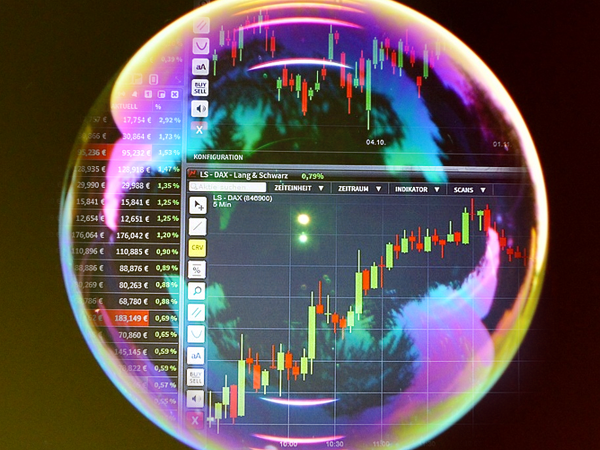 Bulls in the latest Investors Intelligence survey are up to 60.4 percent, which editor John Gray considers the “danger zone.” Moreover, he said current patterns are starting to look a lot like 1987 as the market nears the 30th anniversary of Black Monday. Specifically, he said bulls peaked above 60 percent that year, fell, then moved above 60 again later in the year as the market was about to crash. “That scenario suggests potential significant danger for Oct/Nov 2017!” Gray wrote. On top of all this, Vanguard head Bill McNabb just told the BBC that he expects a “decent-sized correction” in the not too distant future. These are just three voices among many who are beginning to fear that the end may be near. In light of these troubling indicators, what should average savers and investors do to stay safe? That means seek protection when markets start seeming invincible. That means, while others chase profits and run themselves off a cliff, you may want to think about guarding yourself instead. While the masses pile into stocks before a massive correction, follow the “smart money” and consider stalwart real assets like physical precious metals instead. Not only will you enjoy safety from any fallout that could come, but the historical trend favoring precious metals during times of distress could net you healthy gains as well.